The church of St Mary Steps was near the old West Gate, before it was dismantled. It is at the bottom of West Street, adjacent to Stepcote Hill. The original church dates from about 1150 and has some round arched Norman windows. 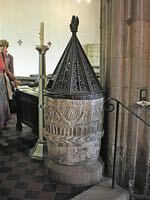 There is also a Norman font with an ornate, conical cover carved by Harry Hems in the 19th-century. Hems also made the altar and he carved the nave screen. The church was rebuilt in the 15th century and now consists of a main building and tower of red Heavitree sandstone. The main floor of the church is several feet above the road level at the front. A flight of stone steps from the entrance leads to the nave, and continues up through the tower to the clock mechanism and bells. The peal of four bells date from 1656, each being about 30 inches across the mouth. 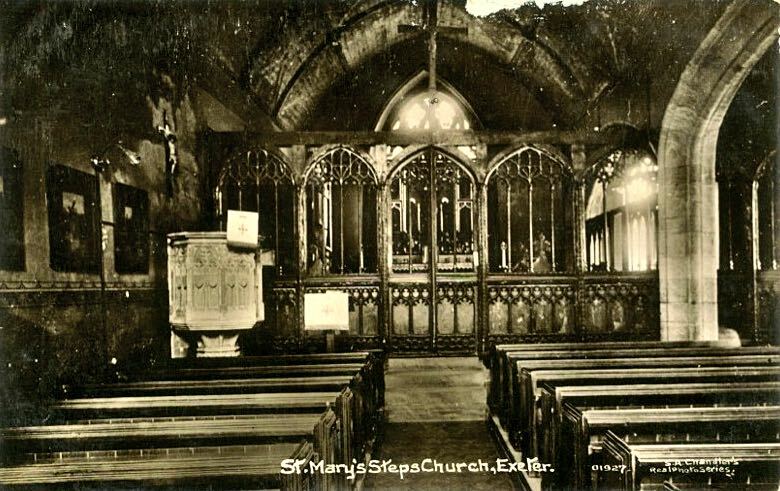 The rood screen in the south aisle is from the St Mary Major Church, which was being demolished, and was installed in 1865. There had been an earlier one dating from about 1215, which was removed at the Reformation, and restored in 1557 when Mary was on the throne. The screen divided the nave from the chancel. It is so named from the Anglo-Saxon word 'rood' which means 'cross'. At the base of the screen are twelve surviving painted panels depicting various saints, including St Bartholemew, St Philip, St Simon and St Jacobus Minor. The five bay rood screen in the nave is by Harry Hems. Beneath the east end of the church is a vaulted room, which served as the house for the porter of the West Gate, and from where, he could go out and claim tolls from those passing through the gate. In the 19th Century the room served as a "kitchen parlour and all," for an old woman who was one of the parishioners. Jenkins thought the room was used as a guard house for soldiers manning the gate opposite. A stone bench, that ran from the guard house to the entrance, along the outer front of the church, was known as the pennyless bench, and supposed to be "for the accommodation of the soldiers". It became a public nuisance because it attracted the idle, and was removed about 1757. Parson's Lane, is situated in Stepcote Hill, opposite the east end of the church – Jenkins noted that "at its upper end is a small ancient house, once the habitation of the rector, but now divided into two tenements for poor widows, who are placed there by the wardens of the parish." Beatrix Cresswell, was of the opinion that the name related to Stepcote Hill, by which it stands, while Jenkins surmised that it was because it was built into a steep slope. 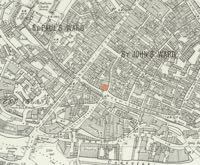 Hoskins is certain that the church was originally known as St Mary Minor, with St Mary Major in Cathedral Yard the senior church. Alan de Baucumbe, was appointed by Bishop Bronescombe on 22 April 1273 as the first rector. During the 16th Century, the living was controlled by the Devon family, the Southcotes of Shillingford – during this period, the parish was one of the poorest in the city. The register dates from 1610, while a transcript exists from 1655. 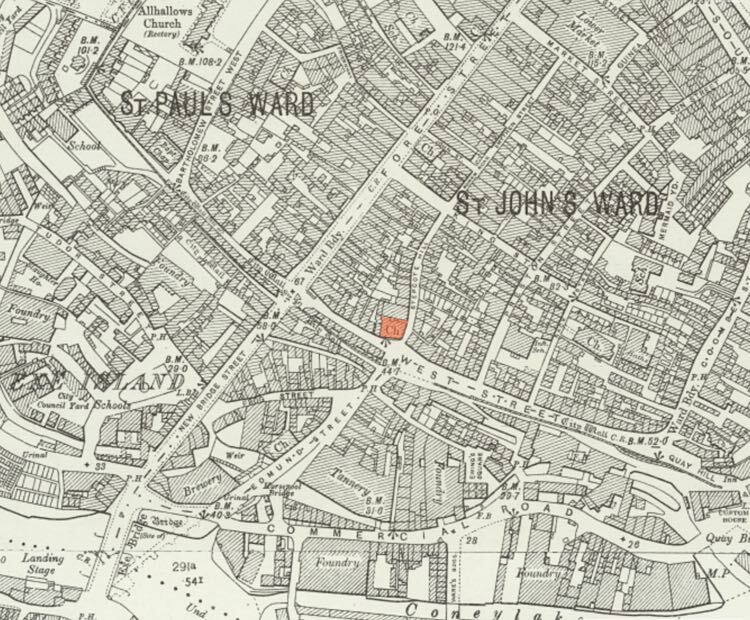 The parish was always a poor one and when Mr. Thomas Downe was appointed Minister by the Commonwealth to St Edmund and St Mary Steps they are described as "being both in the most ignorant and prophane part of the city." The church suffered through the 16th and 17th-century religious purges. Iin September 1559, thirteen pictures and the tabernacle were removed from the church and burned in St Peter's Yard, by command of the Queen's messenger. 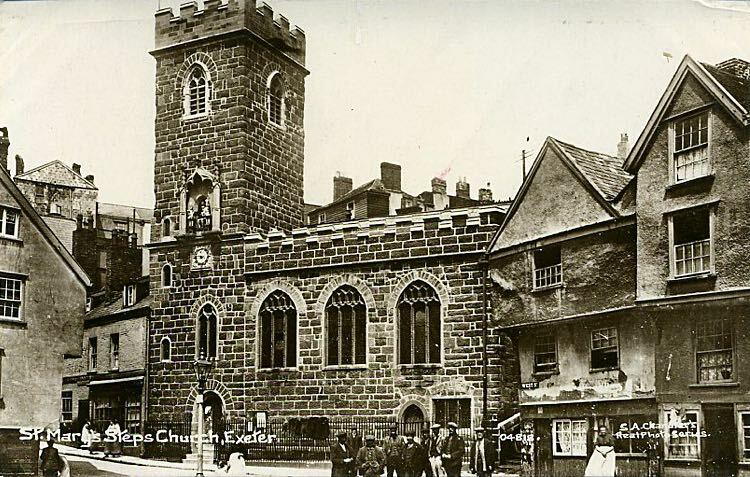 A hundred years later and St Mary Steps was one of thirteen churches in Exeter ordered to be announced for sale by the public crier "... the towers of the churches were to be taken down "clean to the roof by the purchasers and to be converted either into schools or burying places."" On the 14 September 1658, the church was sold for a £100, although it was eventually taken back by parishioners and returned to worship. In 1744 the rector reported that "I have, upon the best calculation I can make, in my parish about 200 families. And of them, I thank God, I have not more than four whole families of Dissenters of any kind". This was a time when so called Dissenters where growing in numbers and threatening the established church. Old Matthew nods his head"
Some of the original decorations of the clock were elaborate carvings depicting a loaded packhorse and ‘the portrayture of the Mill house & of ye trees growing before the same’. They have not survived the ravages of time. Some think it is rather too elaborate for a small parish church, and that it was originally made for the Cathedral – and to reinforce this view, there is a similar clock, in style, can be found in the north tower of Wells Cathedral. Jenkins wrote "Over the dial is a small statue of Henry VIII in a sitting posture which, on the clock striking the hour, bends forward its body; on each side is a statue, in ancient military habit, their morions crowned with feathers; they hold in their right hands javelins, and in their left small hammers with which they alternately strike the quarter hours on two small bells placed beneath their feet". Later research indicates Jenkins was incorrect about Henry VIII. The central figure is Matthew the Miller who nods sagely in the centre of the action – the outer guards are made of painted lead. Classical Gods and Goddesses reclining in the spandrels, are carved into the face – Apollo (top left), Ceres (bottom left), Mars (top right) and Aestas (bottom right). The hours are shown by the rotating dial carrying a painted sun, and the minutes by a gilded pointer terminated by a crescent moon. 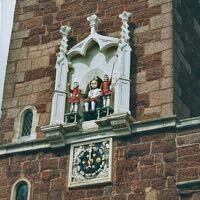 The running of the clock is partly funded by the Exeter Civic Society. The clock was restored in 1980,with a new Beer stone clock face, the old preserved in RAMM (museum)s. The body of the central figure (Henry VIII or Matthew the Miller) is wearing a breastplate, breeches and stockings. It formerly held a hammer to strike the hours. It was removed and re-carved in 1980, with only the original head remaining. The old body is held by RAMM. Sources: White's 1850, Blind Devotion of the People by Robert Whiting, Ecclesiastical antiquities in Devon By George Oliver, Journal of the British Archaeological Association By British Archaeological Association 1826, Exeter Civic Society, Exeter Churches, Beatrix F. Cresswell, 1908. The church in earlier days. The Norman font with a Harry Hems cover. The clock figures were removed for safe storage during the Second War. 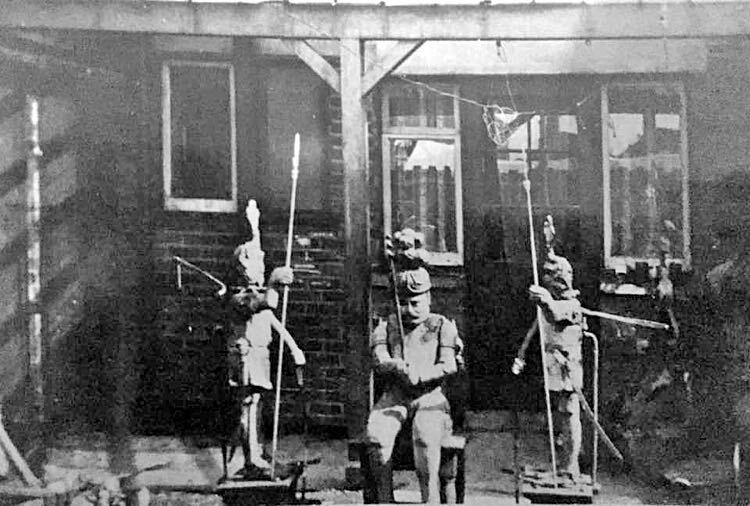 They were held for a few weeks in the rear garden of 71 Isca Road, before removal to a secret store. Photo Steve Haydon. Video of the clock mechanism.